The Design-Bid-Build approach is a requirement for most governmental projects primarily for legal and political matters. At best, the bid process is rarely the least expensive route simply because the contractual relationship is a series of arm’s-length transactions where every day is a battle over money and quality and blame shifting. In the end, it is the owner who pays the price. Low bid does not translate into the lowest price or even the best quality unless you have the best and biggest legal department to force everyone in the project to fully comply before, during and after construction. Low bid extends the time frame of your construction which increases your financing charges, opportunity costs and, in all likelihood, legal bills. Who Wants to Live Like That! McCree’s Enhanced Design-Build is about as dependable and stress-free of a process you will ever have in a construction project. We take Design-Build to heart and have for generations. 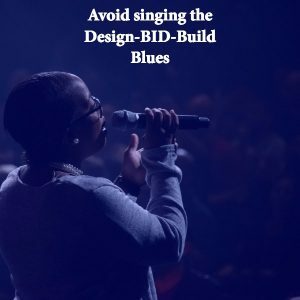 Avoid singing the Design-BID-Build Blues.